Indian Mountain State Park is not a large park but it does have an interesting history in that it used to be a strip mine. The reclaimed land is now a jewel in the crown of East Tennessee. Visitors can bring a picnic lunch or use one of the grills in the picnic area. Groups and families can take advantage of the covered shelter and bright playgrounds. 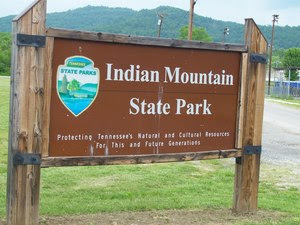 Driving time from Knoxville to Indian Mountain State Park is about 1 hour each way. Take I-75 North from Knoxville and get off at the Jelico exit. From there just follow the signs. Thanks for sharing. It sounds like a lovely spot. It is a nice peaceful place. There are campsites right by the side of the lake which make it even more special.